Recorded in over two hundred spellings including Henry, Henery, Henrey, Heneries and Fitzhenry, this is a European surname. The derivation is from the pre 7th century Old German personal name 'Haimric'. This was a compound of the elements "haim" or "heim" meaning "home", plus "ric", meaning power. It was typical of the warlike personal names, there were no surnames, of the period of history known as 'The Dark Ages'. The name was introduced into England by the Normans in 1066 in the French form of Henri, and it is first recorded in the Latinized spelling of Henricus in the famous Domesday Book of 1086. This book which is in the form of a register, gave an accurate picture of all the land holdings in the country on that date. The surname adopted from the personal name first appears in the latter half of the 13th Century, (see below). Early examples of the recordings include John Henry in the 1293 court rolls for the county of Devonshire, whilst John Fitz Henrie appears in the 1346 Pipe Rolls of the city of London. 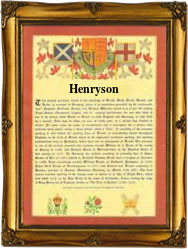 The latter form indicates the patronymic "son of Henry", the Norman suffix Fitz meaning 'son of', or sometimes 'natural son of'. Thomas Henryes was recorded in Somerset in 1379, Thomas Henrysone in the Close Rolls of 1377, whilst in 1723 Mary Henery married William Brock at St. Mary Abchurch, London. The first recorded spelling of the family name is shown to be that of Thomas Henry, which was dated 1273, in the Hundred Rolls of the county of Kent. This was during the reign of King Edward 1st of England, 1272 - 1307. Throughout the centuries, surnames in every country have continued to "develop" often leading to astonishing variants of the original spelling.